A Fresh New Addition to Dominos Hottest Korean Sensation | Fall in love all over again with the sweet and spicy Ssamjeang flavors especially created by Dominos Pizza. 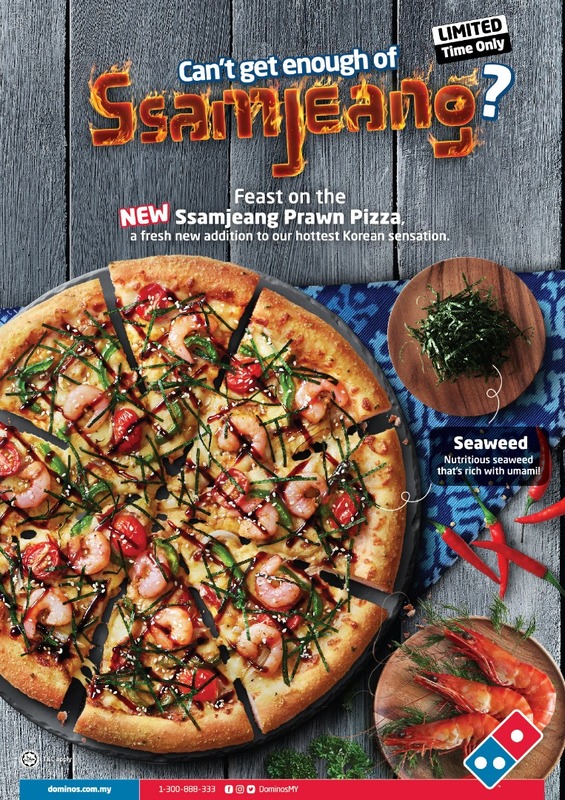 Hot on the trail of its popular Ssamjeang Pizza range, Dominos introduces its latest addition, the new Ssamjeang Prawn pizza, the fourth variant added to the range. Featuring springy, succulent prawns marinated with Italian herbs & spices coupled with nutritious seaweed thats rich with umami flavour, fresh cherry tomatoes, green peppers, sprinkled with roasted sesame seeds atop the specially developed Ssamjeang sauce, the Ssamjeang Pizza is packed with well-balanced flavors and textures. Speaking on the new flavors, Shamsul Amree, Senior General Manager, Operations, Dominos Pizza Malaysia and Singapore said, We received tremendous love and support from our customers and Korean fans when we first launched the Ssamjeang Tuna, Chicken and Beef. 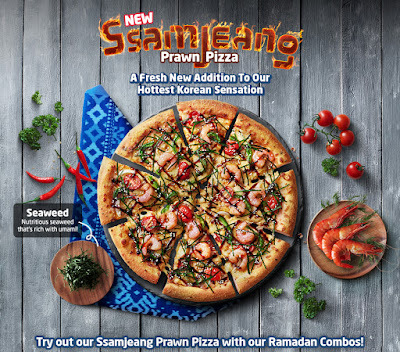 The response was overwhelming and to cater to the growing request of the Ssamjeang pizzas, we have taken it further and created Ssamjeang Prawn. We believe this new addition enhances the flavor profile of the Ssamjeang sauce especially with the delicious combination of multiple flavours and textures in a single pizza. We are heartened by the positive response from our customers and we hope this new flavor will be well received as well. Fasting month and the Raya period is a great opportunity to get together with family and friends while enjoying your favorite pizzas. We are offering fantastic deals for the festive period and we hope our customers will take up the opportunity to enjoy this latest item on our menu while it lasts! Truly inspired by Malaysians love for Korean food, Dominos Ssamjeang Pizzas were specially crafted to deliver the perfect combination of savory, sweet and spicy flavors. Versatile and flavorful, the Ssamjeang sauce is also available with Ayam-haseyo Chicken Wings, a side of chicken wings baked to perfection with an outer coating of the deliciously addictive Ssamjeang sauce. During the festive Ramadan and Raya period, customers can enjoy Ssamjeang Prawn with the two combo deals namely Ssamjeang Buddy Combo and the Ssamjeang Super Combo. Priced at RM37.65 (GST zero-rated price), the Ssamjeang Buddy Combo includes one Regular Ssamjeang pizza, one Ayam-Haseyo, one Garlic Twisty Bread and two cans of soft drinks; while the Ssamjeang Super Combo, priced at RM56.51 (GST zero-rated price) comprises of two Regular Pizzas, one Ayam-Haseyo, one Cheesy Mozzarella/Cheddar Stix and a bottle of 1.5L soft drink. 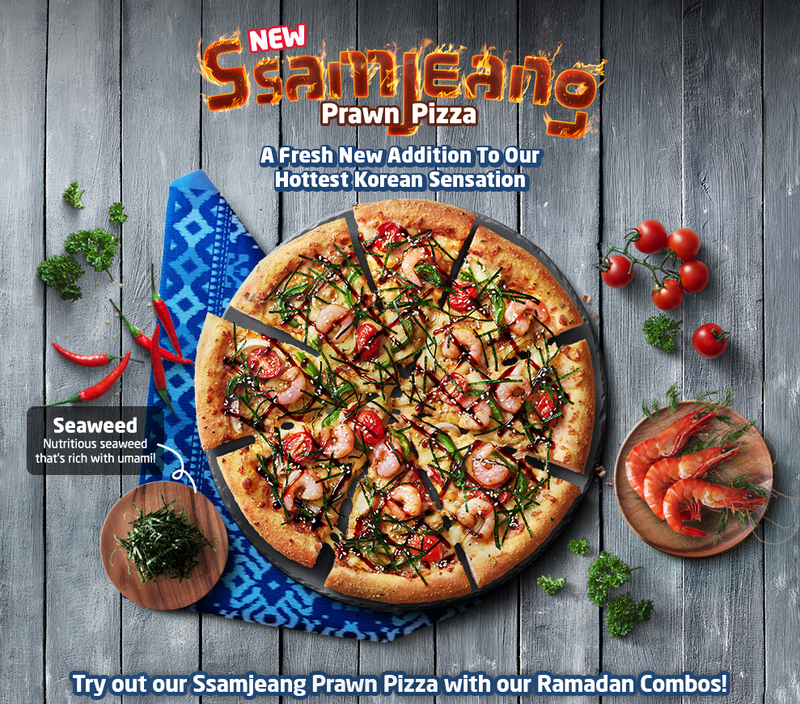 The all new Ssamjeang Prawn is available at all Dominos Pizza stores for a limited time only, from June 4 to July 1, 2018, while stocks last. 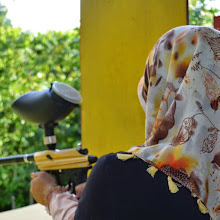 pedas macam megi samyang ke ? takut hehe.. nightmare da makan samyang tu.. tapi suka tengok udang2 tu haih..